I like to spend time on the edges of oceans. There is something about this marginal coastal territory, this meeting point of two totally different environments, that fascinates me. To walk from solid ground into the water and then to float, swim and dive is a form of flying, a feeling of weightlessness and fluidity, a near liberation from the pull of gravity. It is also a departure from all that we know and are accustomed to and for some this is alien and fearful. But to me it feels comfortable and there is a glorious sense of connection, and even of homecoming. Staring out at the horizon from the low vantage point at the water’s edge and watching waves crashing onto the shore is to see the infinite become finite, the death of one rolling seamlessly into the death of another and another ad infinitum. Here in the Pacific I climbed a small hill in the middle of a tiny island and for the first time in my life was afforded a 360-degree view out over a deep blue ocean that stretched away on all sides. Trying to imagine what this would be like from the deck of a boat, to not have the security of Terra Firma beneath one’s feet and to be hundreds of miles from the nearest land, I was shocked into another reality. To be afloat on a tiny craft on this enormous expanse of water that is larger than all of the Earth’s land area combined (169-million square kilometres) is to be as though in outer space. The last and greatest human terrestrial migration was to find and colonise the islands of the Pacific. It was the last great phase of global settlement because it was so remote and so difficult to reach. It was the greatest not just because it spanned a third of the earth’s surface, but because those who explored and settle the Pacific islands had to develop an entirely new technology and way of life, one capable of long-range ocean voyaging along with a system of reliable navigation. These people did not see the oceans as a barrier but more of a pathway. There was never any fear of being lost at sea while armed with their traditional navigation. For these Pacific pioneers the ‘star-compass’ was their basic mental construct for navigation. There are Hawaiian names for the houses of the stars, the places where they come out of the ocean and where they go back. The navigator has to memorise up to 220 stars, differences in constellations, and understand where they’re rising from on this compass (on the canoe) and where they’re going to set on this compass.The navigator’s seat was positioned behind the compass, with different star placements etched in the rails around the canoe or Vaka. A constellation that rises close to east will always set close to west on the other side of the compass. The star compass could also be used to read the flight paths of birds and the direction of waves. When at sea, sunrise and sunset where the most important parts of the day with the sun being low on the horizon and easy to read. At these times the navigator would study the shape and character of the sea, memorise the direction of the wind and the direction of the swells (which are generated by the wind). When the sun rose too high you steer by these swells. At sundown, the waves would be studied to look for changes in shape due to a change in wind direction. The swell pattern would also be observed in case of a change. These were critical details to take into account during the voyage, especially at sunrise and sunset. At night the stars could be used but if the sky was black and heavy with cloud and the swells could not be seen then some Master Navigators can feel the different swell patterns moving under the canoe. To hold a course, the navigator aligns the rising or setting sun to marks on the railings of the canoe. There are 8-marks on either side, each paired with a single point at the stern of the canoe giving bearings in two directions, 32 bearings in all to match the 32 directional houses of the Hawaiian star compass. As wind-drift may be carrying the canoe to the right or left of its apparent heading, the navigator corrects his steering for this sideways drift, called ‘leeway’. Sailing a large double-hulled canoe constantly tests endurance and strength; steering using the massive ‘tu’oe’ or steering oar could only be done in sessions of an hour at a time. During midday and on cloudy nights when celestial bodies are not available at the horizon as directional clues the navigator uses the wind and swells to hold a course. However, the direction of wind and swells cannot be determined independently: their direction can only be determined by reference to celestial bodies such as the rising or setting sun. Swells are waves that have travelled beyond the wind systems or storms that have generated them, or waves that persist after the generating storm has died away. Swells are more regular and stable in their direction than waves (waves as opposed to swells are generated by local, contemporary winds). Sometimes swells can be felt better than they can be seen, having flattened out after travelling long distances. Swells move in a straight line from one house on the star compass to a house of the same name on the opposite side of the horizon, 180-degrees away. The navigator can orient the canoe to these swells. When the seas are confused, navigation by ocean swells is difficult. On coastal voyages, a navigator can steer quite easily by lining up landmarks. At sea however, Pacific mariners talk much of ‘seamarks’. These signposts in mid-ocean consist of swarms of fish, flocks of birds, groups of driftwood or conditions of wave and sky peculiar to certain zones of the sea. These seamarks are found along routes between islands and indicate to the navigator that he is at a certain point along his route. Navigation without instruments is not a precise science. Poor weather and mental lapses on a long voyage adversely affect its accuracy. But the navigator need not sail to a destination with pinpoint accuracy to be successful. Instead a navigator in the Pacific tries to hit a ‘screen’ of islands, that is, a group of islands that stretch out on either side of his destination. Islands in the Pacific are seldom isolated, they are usually found in clusters. Navigation went on around the clock and there was no rest until they have ‘raised the island’. While there are open ocean gaps between islands in a screen, a navigator looks for signs to let him know the proximity and direction of land even when he cannot see it. Signs of land include drifting land vegetation; clouds piled up over islands; the ‘loom’ effect above an island created by sunlight or moonlight reflecting up from the white sand and smooth water of a lagoon; distinctive patterns of swells caused by swells refracting around and/or off islands; and seabirds. Some seabirds go out to sea in the morning to feed on fish and return at night to rest. The diurnal flights of such birds are the most useful signs for expanding landfall since their flights to and from an island give a fairly specific direction to the navigator. Early seafarers had no qualms about sailing close to the wind, if no new land was found, they had the wind behind them to return them to their original departure point. They sailed in fleets so as to have more people, livestock, plants and warriors on board for a successful colonisation. And so back to the Cook Islands and Rarotonga. We are here during the 50th anniversary year of this Pacific country’s independence in 1965 which saw the Cook Islands become a self-governing country in free association with New Zealand. To celebrate this event six Vakas sailed from Auckland, New Zealand in early May and came to Rarotonga landing at the Avana Passage on the east side of the island. Avana Passage is symbolic because it is also were the ‘Great Migration’ took place in the 14th-century and seven large ‘Vakas’ sailed and found New Zealand. To see these ancient vessels come through the passage and into the lagoon was a truly beautiful sight. The crews were greeted by a huge welcome party, Hakas were performed on both sides, salty garments ritually cleansed, floral ‘Lei’ garland distributed to all and all to the accompaniment of superb Cook Island drumming. 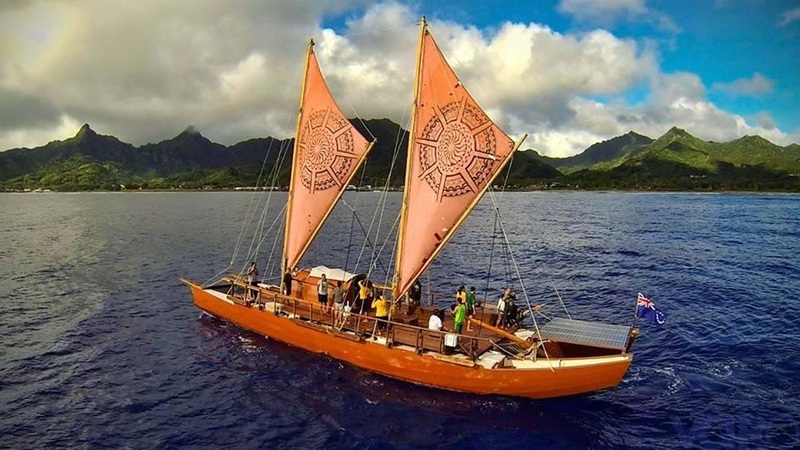 Non-instrument navigation is no longer a near-extinct art and is being steadily reinvigorated through the work of people such as the Micronesian Mau Pialiug, one of the last master navigators in the Pacific with the ability to revive this ancient tradition and subsequently reunite Polynesia through its collective cultural pride. So, as someone who has spent countless hours often far out to sea and in large swells on a very small craft (a surfboard), yet never without sight of land, I am humbled by these epic ocean-going voyages. Celestial navigators past and present I salute you all. You were the earth’s first true star-sailors and what you did and continue to do is every bit as courageous and extraordinary as setting off into space. This entry was posted in South Pacific, travel and tagged Adventure, Celestial navigation, Cook Islands, Double-hulled canoes, Migration, Navigation, New Zealand, non-intrument navigation, Pacific Ocean, Polynesia, Rarotonga, sailing, travel, Vakas by Ashby's World. Bookmark the permalink. Interesting post! I love the South Pacific for its remoteness and I hope to visit it again soon… The migration to these islands is a pretty amazing achievement.